I wore this out to lunch with my sister and our friend weekend before last, but I wanted to feature this look because it's a great example of what I wear as a casual weekend look or even of what I wear to class. I'm a huge fan of blazers as you know, and love mixing them with casual pieces to easily pull a look together. Cute flats are also essential when walking through downtown or across a rather massive campus! This Budweiser tee is one of my favorite t-shirts and I happened to score it from the Target men's section! Don't forget to enter my giveaway with Red Apple Lipstick for a $50 giftcard! See all the details in this post, or enter below! I so love this look! The tee is the best and such a cute purse! Love it! Maravilloso look!!! Me enloquece tu camiseta!!! I love dressing up a plain tee with a blazer, too. Plus, as a Budweiser fan myself (Bud Light usually), I love the top! I love this outfit and that tee is awesome specially for a beer lover like myself. always a fan of using a blazer to dress up denim - and i adore your bright bag! This is such a cute and casual look, I love how you dressed up the tee with a blazer! And your red bag is so cute:) I wear a similar outfit for school too! you do casual chic so well! Haha such a cute tee! I'm an un-embarrassed Bud Light fan, so I'd totally rock this! This is such a simple and chic outfit. Love it! Hope you had a great weekend! Perfect outfit for luncheon with the girls over the weekend.. chic and up to date! I'm pretty jelly of your blazer collection missy! 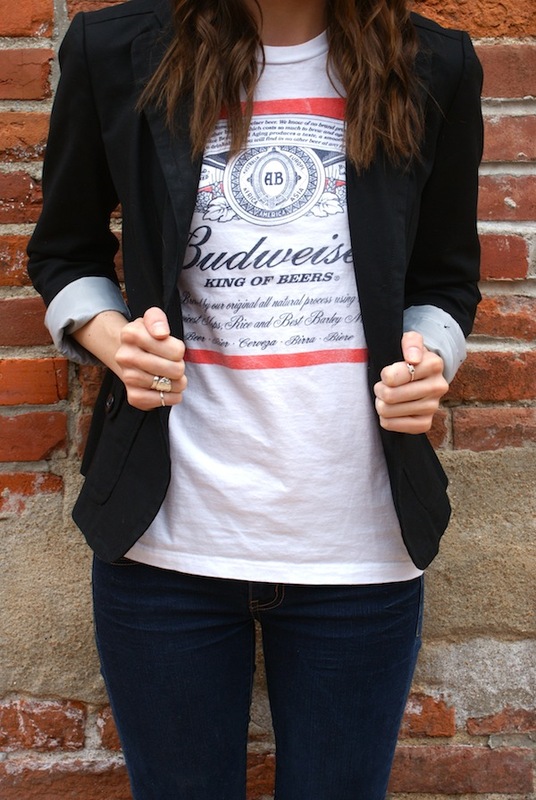 I have never seen Budweiser look so classy ;) I LOVE how you chic-ed that tee up with a black blazer- i need to remember that style trick! Hey girl! I love those flats so much! So bummed that they're sold out! I'm such a jeans, tee, and blazer girl.... you've definitely won me over with this outfit! You look gorgeous as always:)! Fabulous outfit, loving the blazer in this look! Very pretty!